Brown's Creek Tributary Masonry Arch Bridge is located on a rural county road northeast of Glen Elder in Mitchell County. This triple-arch limestone structure was built in 1936 as a project of the Works Progress Administration, a New Deal-era federal work program. It is built of stone mined locally and is virtually unaltered since its construction. The bridge is nominated for its local significance in the areas of government, social history, and engineering. 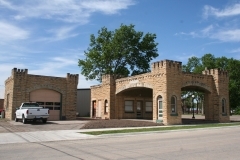 It was nominated as part of the "New Deal-era Resources of Kansas" and "Masonry Arch Bridges of Kansas" multiple property nominations. 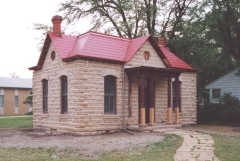 The Abram Click Farmstead is a collection of six historic farm resources located at the southeast corner of Kansas Highway 14 and US Highway 24 on the northwest edge of Beloit. Click, a Kentucky native, was living in the Beloit area as early as 1873, and his arrival was part of an influx of new residents into Mitchell County that occurred between 1870 and 1880. He received his patent for 40 acres in 1880, but he sold the improved land in 1883. The property continued to function as a farmstead through the 1980s. 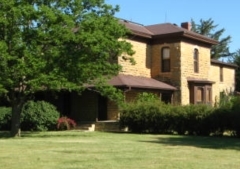 Today, the farmstead is owned by the Mitchell County Historical Society and includes 6.8 acres with a limestone house, barn ruins, water tower, washhouse, granary, and outhouse ruins. 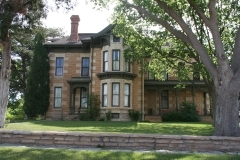 The Gothic Revival house was constructed circa 1880 and features ornate window hoods, dressed sills and quoins that is likely the work of Joseph Hill, a locally well-known 19th century stone mason. 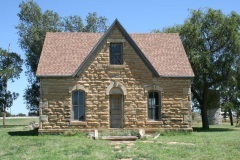 The house is an excellent representation of early construction in Mitchell County. The later wood-frame washhouse, granary, and outhouse demonstrate the evolution of the farmstead into the early 20th century. 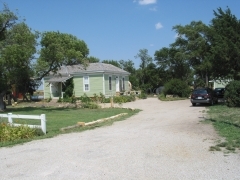 The property was nominated as part of the "Historic Agriculture-Related Resources of Kansas" multiple property nomination for its local significance in the areas of agriculture and architecture. 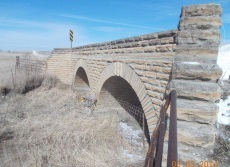 The North Rock Creek Masonry Arch Bridge is located on a rural county road northeast of Hunter in Mitchell County. This double-arch limestone structure was built between 1936 and 1940 as a project of the Works Progress Administration (WPA), a New Deal-era federal work program. It is built of stone mined locally. Its precise date of construction is not known, and the structure features no date stone. It is built of stone mined locally and is nearly identical to the other known WPA bridges in the area. The bridge is nominated for its local significance in the areas of government, social history, and engineering. 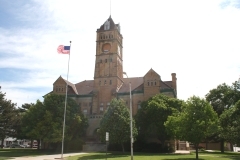 It is nominated as part of the "New Deal-era Resources of Kansas" and "Masonry Arch Bridges of Kansas" multiple property nominations.